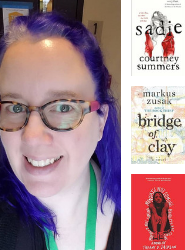 We asked Teen Librarian Andrea which books she’s recommending today. She chose a combination of mysteries, thrillers and realistic fiction, with secrets and suspense aplenty. Sadie hasn’t had an easy life. Growing up on her own, she’s been raising her sister Mattie in an isolated small town, trying her best to provide a normal life and keep their heads above water. But when Mattie is found dead, Sadie’s entire world crumbles. After a somewhat botched police investigation, Sadie is determined to bring her sister’s killer to justice and hits the road following a few meager clues to find him. The story of five brothers who bring each other up in a world run by their own rules. As the Dunbar boys love and fight and learn to reckon with the adult world, they discover the moving secret behind their father’s disappearance. At the center of the Dunbar family is Clay, a boy who will build a bridge—for his family, for his past, for greatness, for his sins, for a miracle. The question is, how far is Clay willing to go? And how much can he overcome? Monday Charles is missing, and only Claudia seems to notice. Claudia and Monday have always been inseparable—more sisters than friends. So when Monday doesn’t turn up for the first day of school, Claudia’s worried. When she doesn’t show for the second day, or second week, Claudia knows that something is wrong. Now Claudia needs her best—and only—friend more than ever. But Monday’s mother refuses to give Claudia a straight answer, and Monday’s sister April is even less help. No one seems to remember the last time they saw Monday. How can a teenage girl just vanish without anyone noticing that she’s gone?